How can art enhance and enrich the Christian faith? 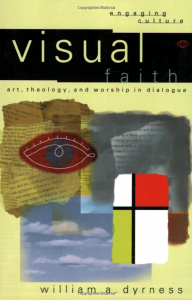 What is the basis for a relationship between the church and visual imagery? Can the art world and the Protestant church be reconciled? Is art idolatry and vanity, or can it be used to strengthen the church? Grounded in historical and biblical research, William Dyrness offers students and scholars an intriguing, substantive look into the relationship between the church and the world of art. Faith and art were not always discordant. According to Dyrness, Israel understood imagery and beauty as reflections of God’s perfect order; likewise, early Christians used art to teach and inspire. However, the Protestant church abandoned visual arts and imagery during the Reformation in favor of the written word and has only recently begun to reexamine art’s role in Christianity and worship. Dyrness affirms this renewal and argues that art, if reflecting the order and wholeness of the world God created, can and should play an important role in modern Christianity.